Sitting at the corner of Evergreen and Folsom streets in Boyle Heights is a 1914 Mission Revival structure that has recently been nominated for the National Register of Historic Places. The facility was originally the Forsyth Memorial School for Girls, an institution established by the local Presbyterian Church as a facility to "Americanize" Latinas. The complex was designed by architect Henry M. Patterson, who worked on many regional Presbyterian churches, and built by The Willard-Slater Company. There isn't that much information out there about the Forsyth School, but it is notable to read some of the thinking behind the work being done by it and similar institutions of the time. 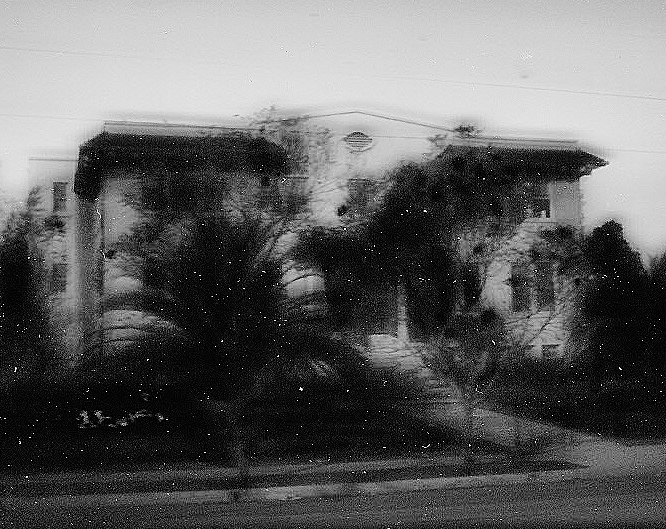 The Forsyth Memorial School for Girls, Boyle Heights, from a 1927 lantern slide. Courtesy of the Workman and Temple Family Homestead Museum, City of Industry. Click on any image to see them in enlarged views in new windows. A short-lived organization called the Interchurch World Movement (IWM) emerged within weeks after the end of the First World War, late in 1918, proclaiming its mission to bring together the various Protestant churches in America and coordinate programs and services promoting Christianity, including to peoples who were either not Christian or were, but not Protestant. the Christian task [is] not only to place the dynamic of God's life into the heart of the individual Mexican, but also to put the redemptive force of Christianity into the community itself, saving the Mexican from poverty, disease, crime, industrial injustice, exploitation and ignorance as well as from sin. Note that Oxnam refers to "Christianity" as if Mexicans were not, by being Catholics. Writing that the city included about 30,000 Mexicans among its residents, Oxnam stated that "Consequently the Christian [Protestant] forces should draft a long-time program, seeking the complete transformation of all anti-social conditions, and the building of a community life that approximates the demands of Jesus." 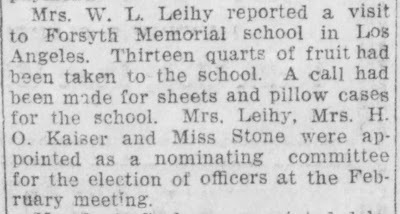 A short reference to the Forsyth Memorial School for Girls in the Santa Ana Register, 17 January 1919. Among the many community institutions cited by Oxnam in his report was the Forsyth Memorial School for Girls which "is a boarding school taking care of 75 Mexican girls" and had a property value of some $50,000. In 1925, Anna Browning Diveley submitted her master's thesis to Boston University on "The Problems of Mexican Immigration in the Southwest". Diveley opened her work with the admirable statement that, "A mutual understanding of the people of the United States, and of the Mexicans, who came to us, is necessary for the happiness and well being of both." She further noted that Mexican "peons" emigrated to America "in search of new horizons" and wanted "better conditions, more work, better wages and schools for the children." They were drawn by "railroad companies, beet growers and others who were in search of laborers" and "offered them what to the Mexican was a good wage." These immigrants are at heart Mexicans . . . A very small number are even naturalized. There are logical reasons for this. This peculiar attitude, on the part of the Mexican has a historical, a temperamental and a social background, So many of them are so near the mother country, that they cannot realize they are in a different country. The Mexican has very much of the Indian characteristics. Always watchful, they are by nature superstitious and view almost every news with suspicion. There were seeds of hatred sown early in the nineteenth century, during the days of the Mexican war. That hatred, with their natural fear of changes and their undeveloped intellect, coupled with their inherent patriotism make it hard to become a citizen. As "a national as well as a border problem," Mexican immigration had to be dealt with, as Oxnam argued, by promoting to migrants "our ideals, our standards" and that they "should not be left a victim of shiftlessness or of revolutionary or anarchical tendencies." 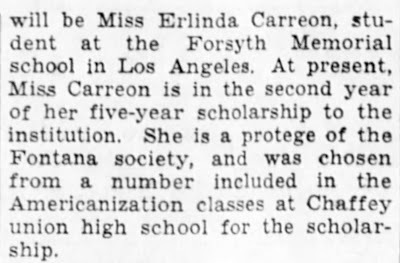 The San Bernardino Sun, 25 December 1931, included a reference to Forsyth Memorial School for Girls scholarship student, Erlinda Carreon, a Fontana resident. Diveley ended her thesis with the observation that,"It is the privilege and the duty of the government of the United States, also of the Christian people to help these less fortunate people to a higher plane, and to do this, they need better housing, less crowding, and a wholesome training for citizenship, and an uplift of clean joy." She offered that, "Every race in America has its vices, also every race has its virtues, and it is the task of the Christian people to burn the dross and strengthen the virtues." Notably, she went on, "The Mexicans have a religious background but they do not have a practical Christian education. Catholicism did not furnish this. Protestantism is supplying this need to some degree." atmosphere is found. From such influences, the Mexican is responding." Presumably, the Forsyth Memorial School for Girls was one of these "community centers." As noted above, specific information about Forsyth is lacking. 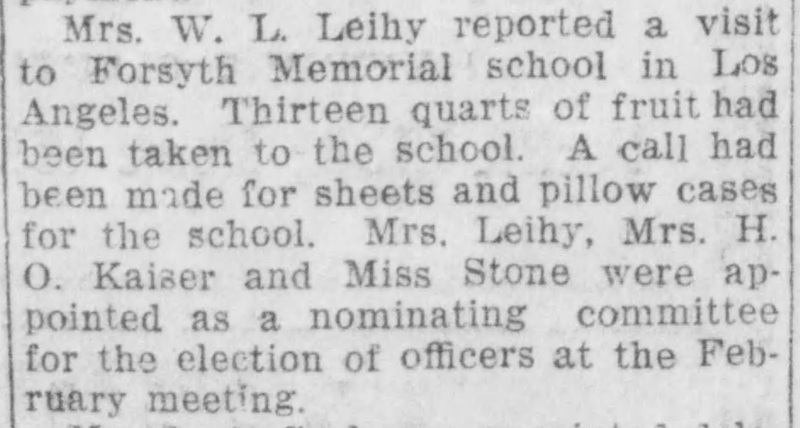 Occasional newspaper references mention Protestant groups from Long Beach and Tustin visiting the school and providing canned fruit, sheets and pillowcases to the students there. In August 1928, the Santa Ana Register reported on a United Brethren church picnic in Anaheim included a talk by Constance Ward, a teacher at Forsyth, "who presented a picture of her work among the Mexican girls in this training school." 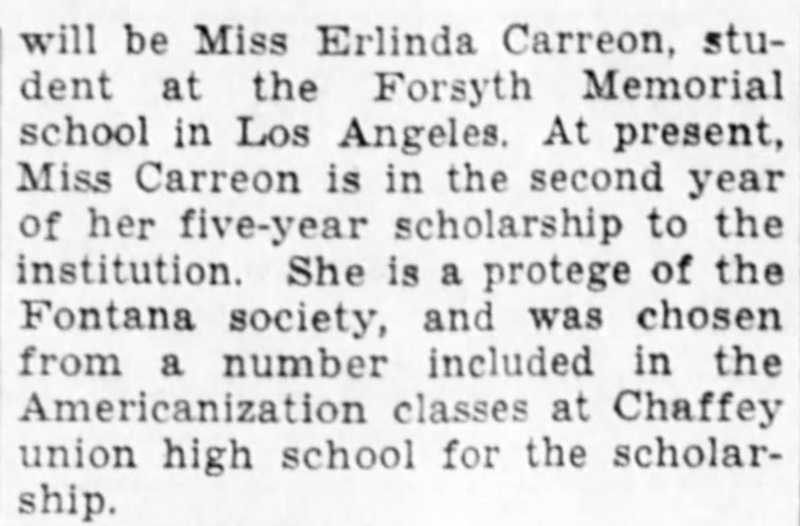 The San Bernardino Sun in its Christmas Day 1931 edition noted that an honored guest at a Fontana church function was "Miss Erlinda Carreon, student at the Forsyth Memorial school in Los Angeles." In the second of a five-year scholarship, Carreon was a "protege" of the Fontana church "and was chosen from a number included in the Americanization classes at Chaffey union high school for the scholarship." It may be that Carreon was barely able to finish out her scholarship, because Forsyth closed its doors in 1934, probably because of the crushing effects of the Great Depression. For a time, the facility functioned as the Hebron Community Center, another Presbyterian endeavor. 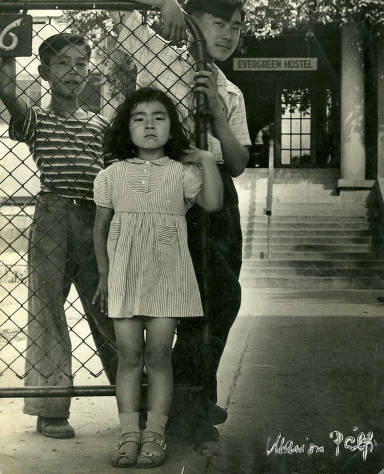 Jun Oyama and two unidentified boys at Evergreen Hostel, Boyle Heights. From the Foto East L.A. collection, County of Los Angeles Public Library. Then, with the conclusion of another world war came a new, temporary use. 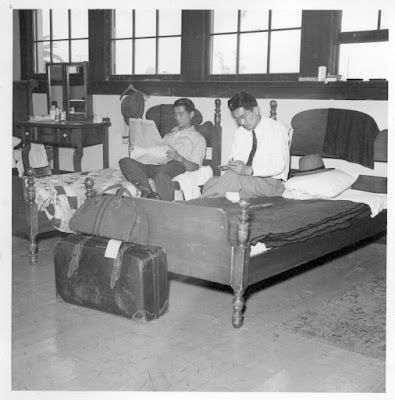 Reconstituted as the "Evergreen Hostel," the site was utilized for the resettlement of interned Japanese-Americans sent to concentration camps throughout the U.S. during World War II. 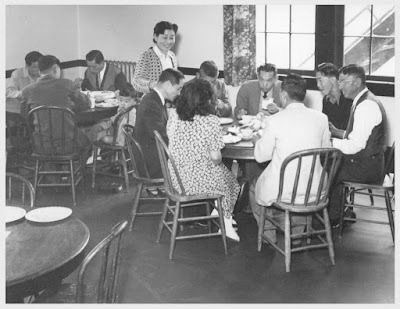 Brian Niiya, in an article for the online Densho Encyclopedia, noted that Evergreen was "one of the first hostels to open on the West Coast, [and] it was one of the largest and most highly regarded." The structure was rented by the Presbyterian Mission Board to the American Friends Service Committee and first used to house Japanese-Americans forced out of Terminal Island in 1942. In 1943-44, the structure was utilized by the U.S. Army. James, Jennie and Gary Shimokawa arrive at Evergreen Hostel and are greeted by Rev. Sohei Kowta. Photograph by Charles E. Mace, 1 June 1945. Courtesy of the Bancroft Library, UC Berkeley. 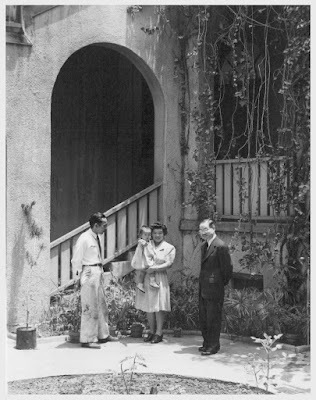 On 1 March 1945, after renovation work, the hostel, managed by Esther Rhoads of the AFSC and Presbyterian minister Sohei Kowta, opened, following by several weeks one in Pasadena. The initial capacity of 60-75 was enlarged to over 100 with furniture used in concentration camps transferred to the facility. Room and board was $1 to $1.50 for adults and half that amount for children and residents were required to do housework as a condition of residency. Hundreds of persons were housed there in the roughly two years of operation. For the full article by Niiya, click here. Lunch served to residents at the Evergreen Hostel, Boyle Heights, Photograph by Charles E. Mace, 1 June 1945. Courtesy of the Bancroft Library, UC Berkeley. In recent years, as cited in the National Register application, the facility had been known as the "Fellowship House of Los Angeles," and appears to have been used as a sort of hotel, based on a short description on a blog post that also features some great 1945 photos of the Evergreen Hostel. For that blog post, click here. Henry Suenaga and Ben Nishiyama in a men's dormitory at the Evergreen Hostel. Photograph by Charles E. Mace, 1 June 1945. Courtesy of the Bancroft Library, UC Berkeley. 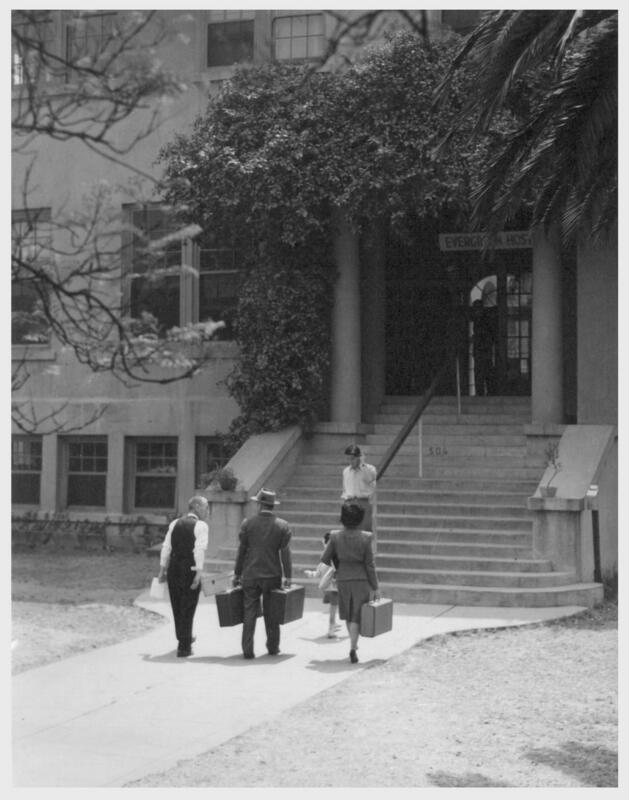 Although the National Register nomination was made on the basis of the Forsyth's history as an "Americanization plant" for Latinas, the use of the complex for the hostel seems another obvious reason for receiving recognition as a place of significant historical interest. George, Ann, and Robbie Jeane Yanase with Rev. Sohei Kowta at Evergreen Hostel. Photograph by Charles E. Mace, 1 June 1945. Courtesy of the Bancroft Library, UC Berkeley. For the National Register nomination, click here. For a City of Los Angeles report with the Cultural Heritage Commission's support for the National Register nomination, click here. Contribution by Paul R. Spitzzeri, Assistant Director, Workman and Temple Family Homestead Museum, City of Industry. Hello, is there anyway to get a tour of this site? who do i have to call or get in contact to gain access to this location?